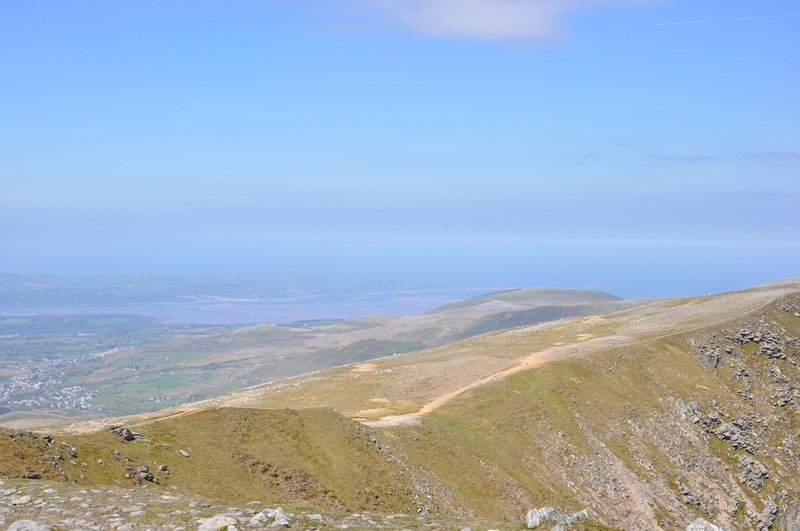 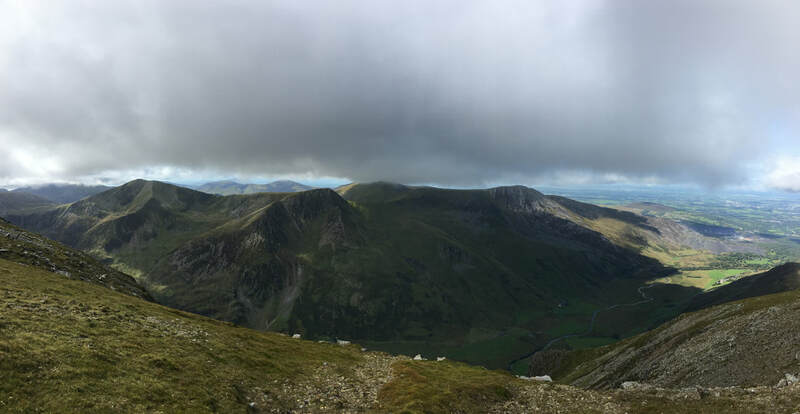 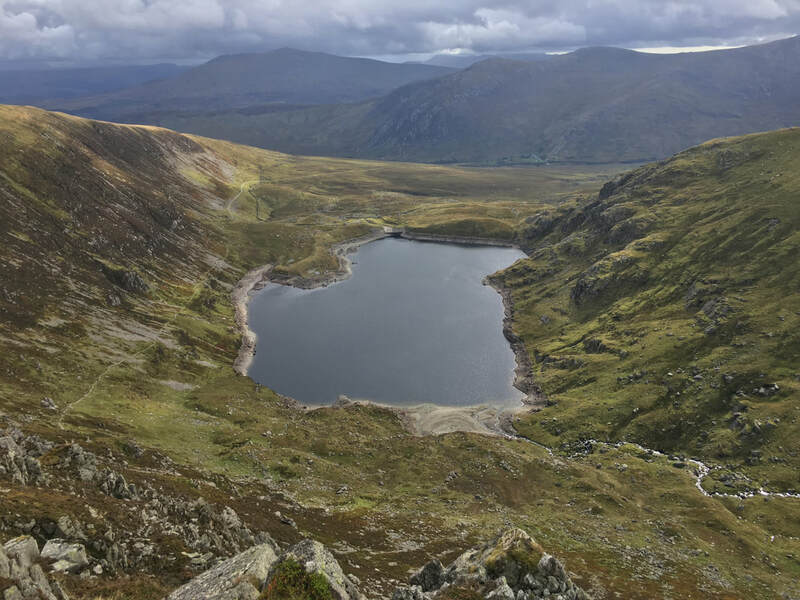 ​​The Carneddau are a group of mountains in Snowdonia and are the largest contiguous stretch of mountain land in Wales & England. 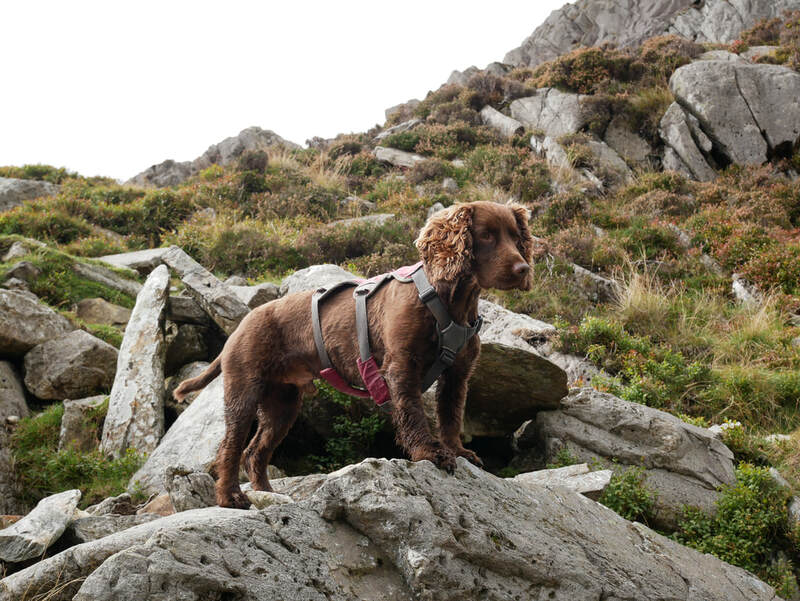 They are maybe not as rugged as the Snowdon massif or the Glyderau but are impressive nevertheless. 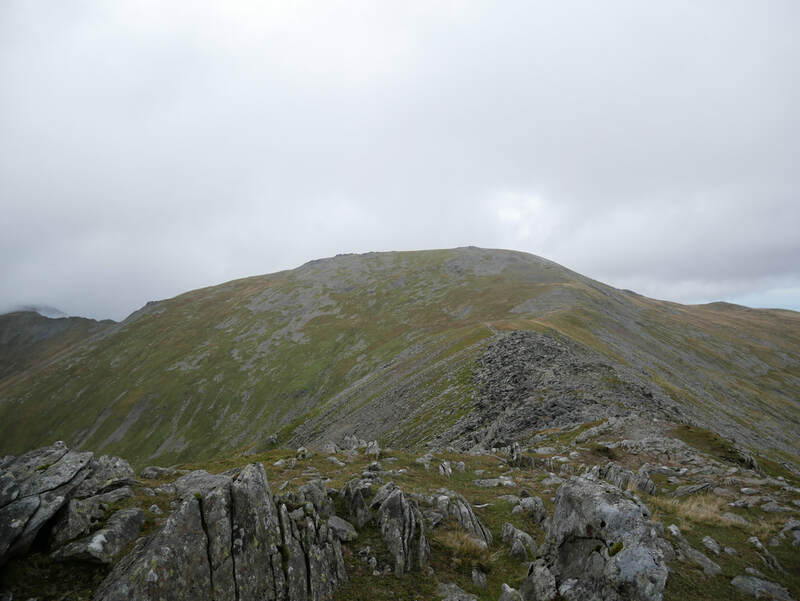 Much of the higher tops are covered with rough grass and heather with patches of shattered rocks. 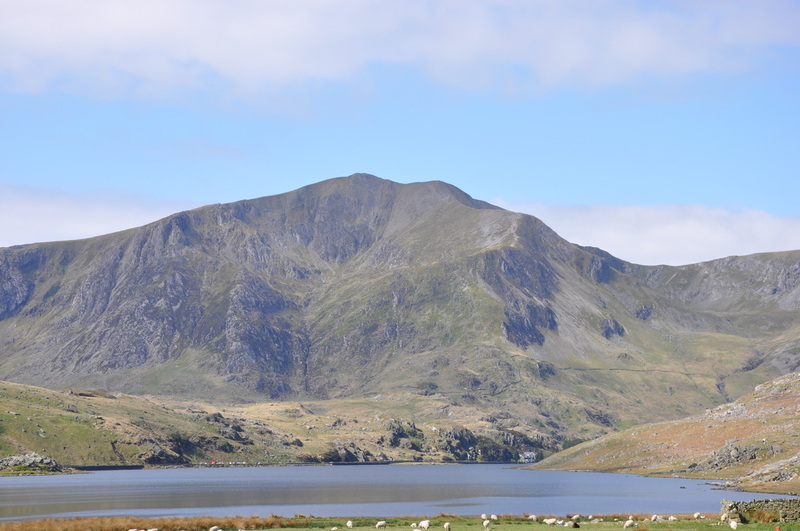 Pen-yr-Ole-Wen (Head of the White Slope) lies on the western edge of the range and dominates the Nant Ffrancon pass. 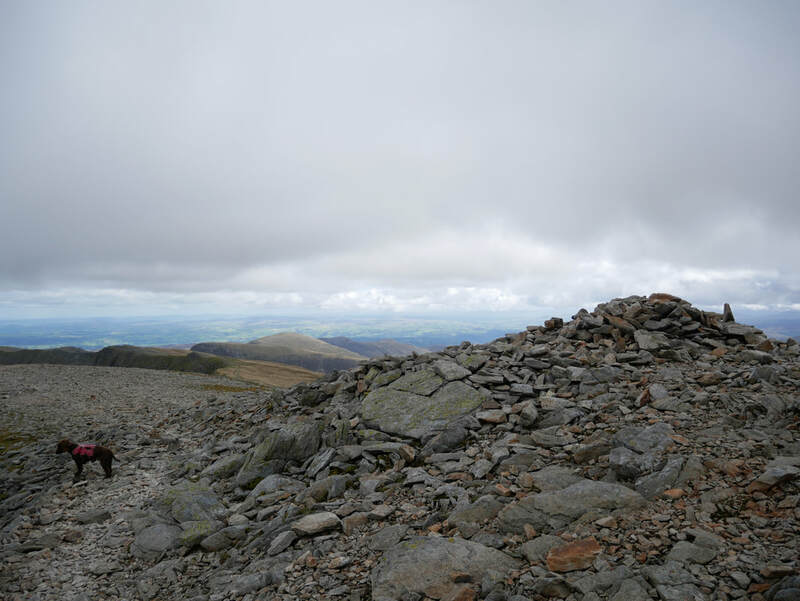 Continuing along the ridge from here Carnedd Dafydd (David's Cairn) is reached, then Carnedd Llewellyn (Llewellyn's Cairn) and on to various lower summits. 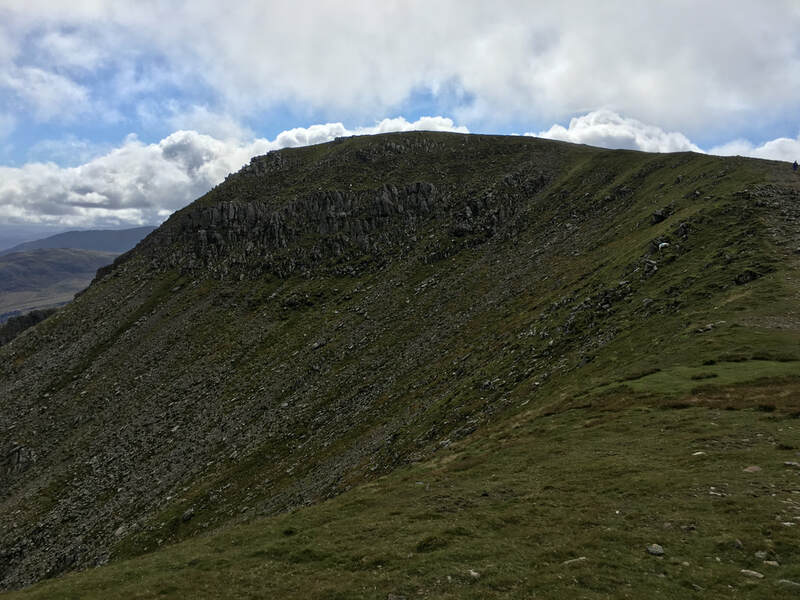 To the north and west of the ridge are mostly grassy slopes, while to the east there are some high cliffs, deep valleys and small lakes. 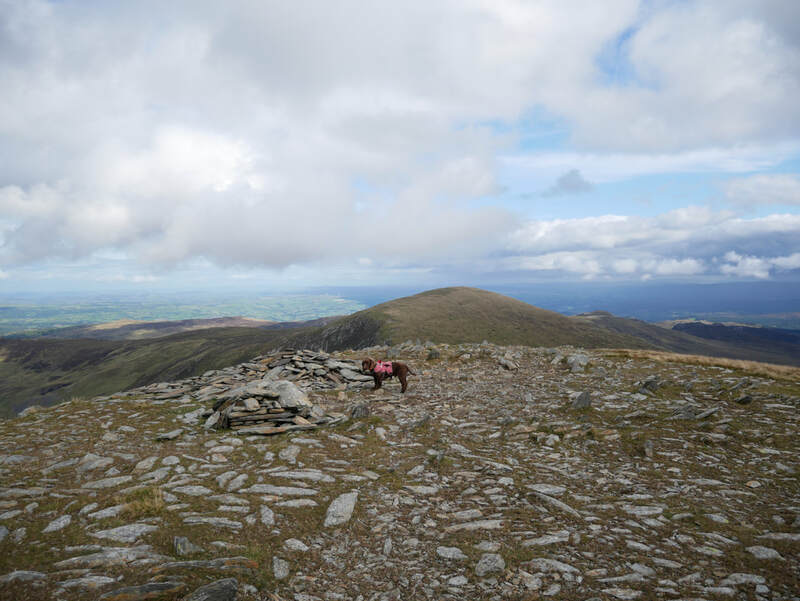 Apparently the Carneddau range is home to the only population of wild horses in the United Kingdom. 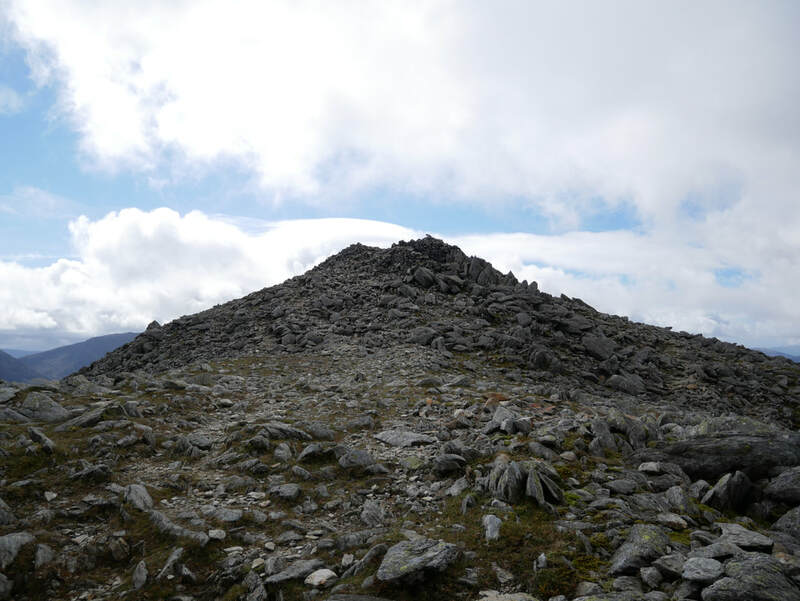 The walk today is one we have done a few times over the years - this time we would add on the summit of Pen yr Helgi Du (Head of the Black Hound). 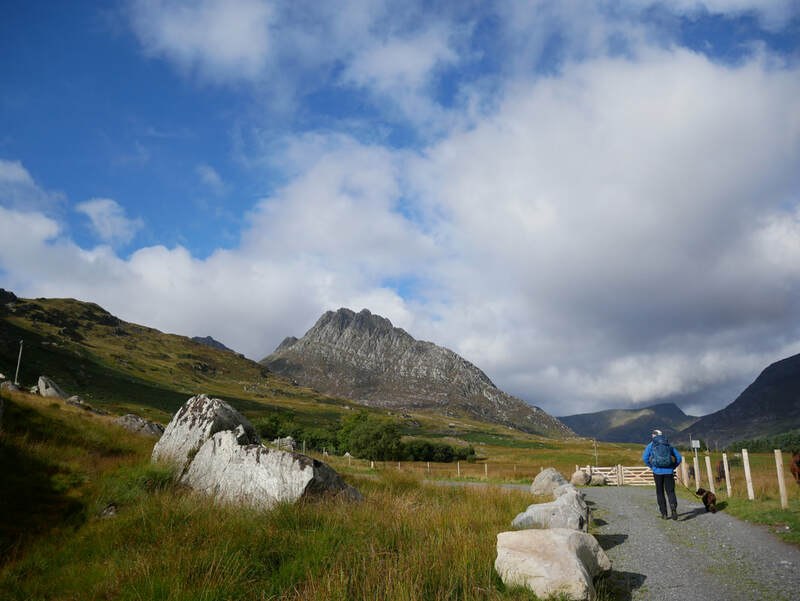 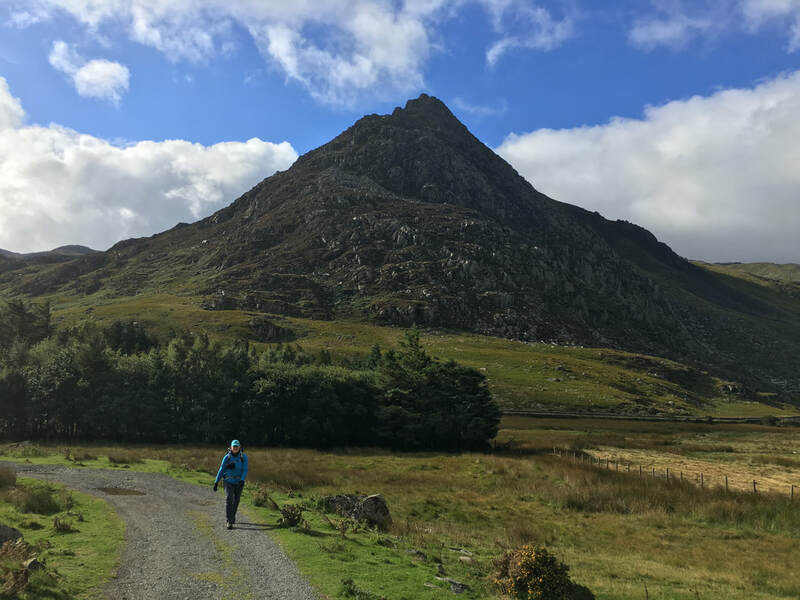 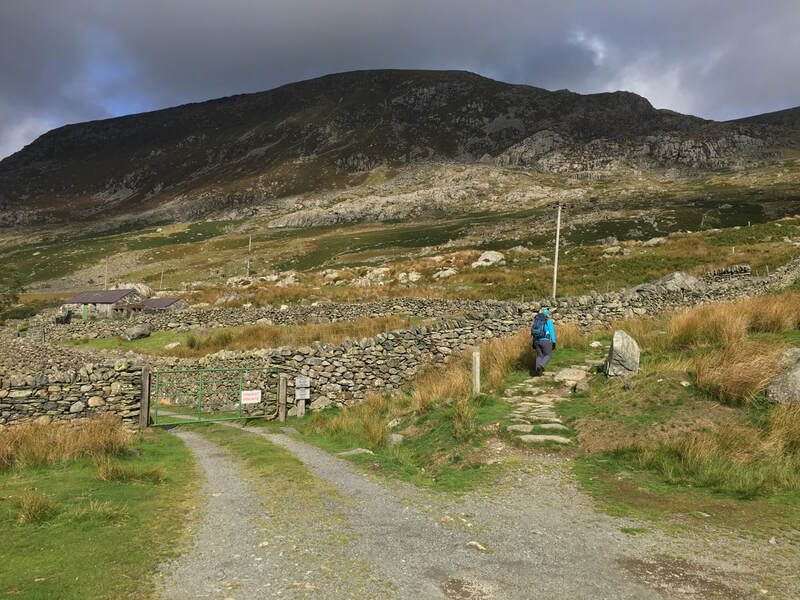 There are several places to start this walk from however today we parked up at the farm at Gwern Gof Isaf just below Tryfan. 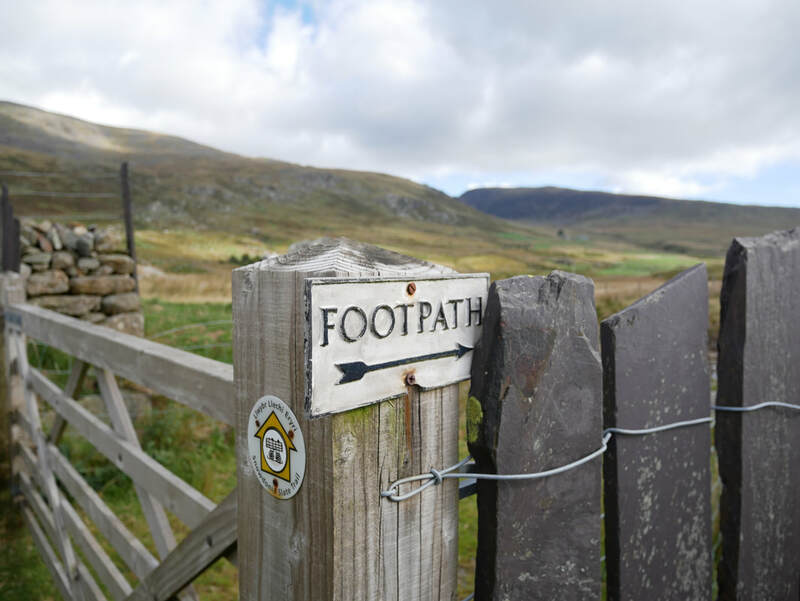 A delightful path leaves the farm to run parallel with the A5 to emerge at the road opposite Glan Dena - the buildings here are owned by the Midland Association of Mountaineers. 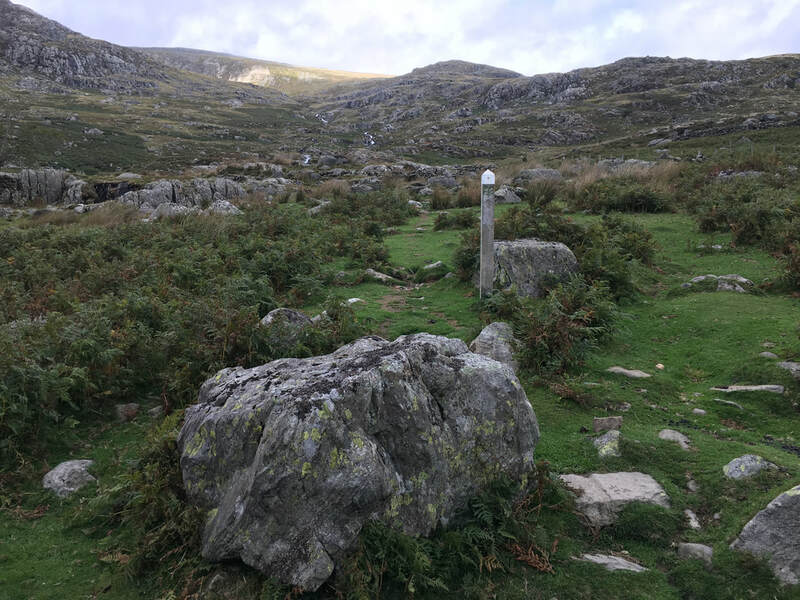 Leaving the track at Tal y Llyn Ogwen Farm soon the Afon Lloer is crossed from where a sometimes intermittent path is followed in the general direction of north towards Clogwyn Mawr - white topped posts show the route. 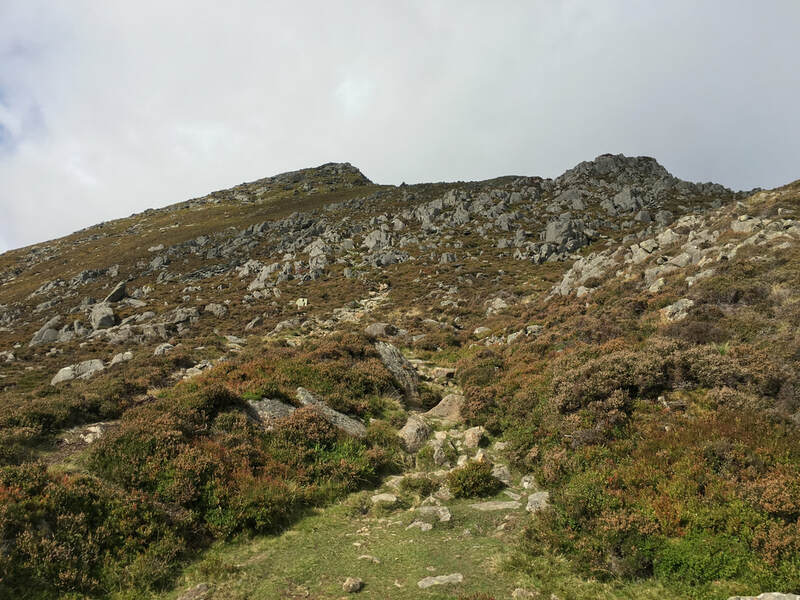 The gradient eases and the path turns to the west to reach the foot of Pen yr Ole Wen's eastern ridge. 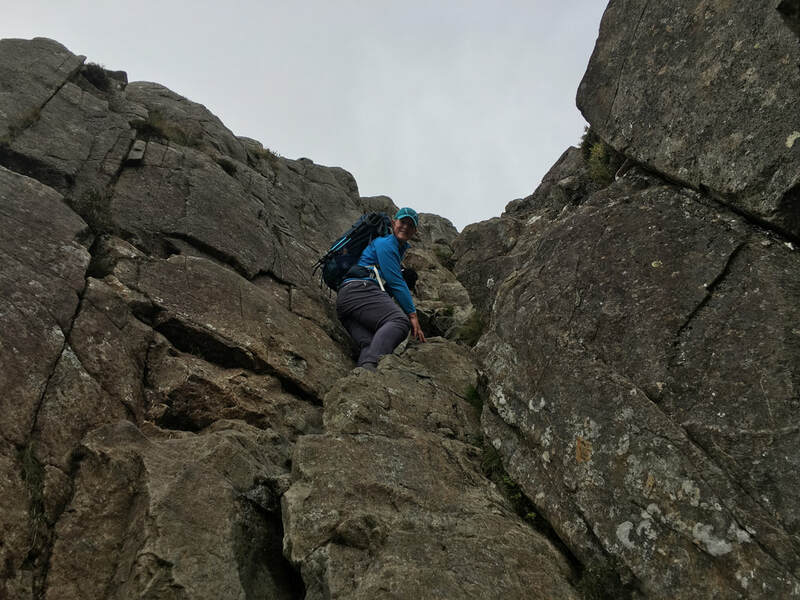 Now the fun starts - a delightful scramble up a rocky chute which, whilst appearing difficult at first is not as hard as it looks. 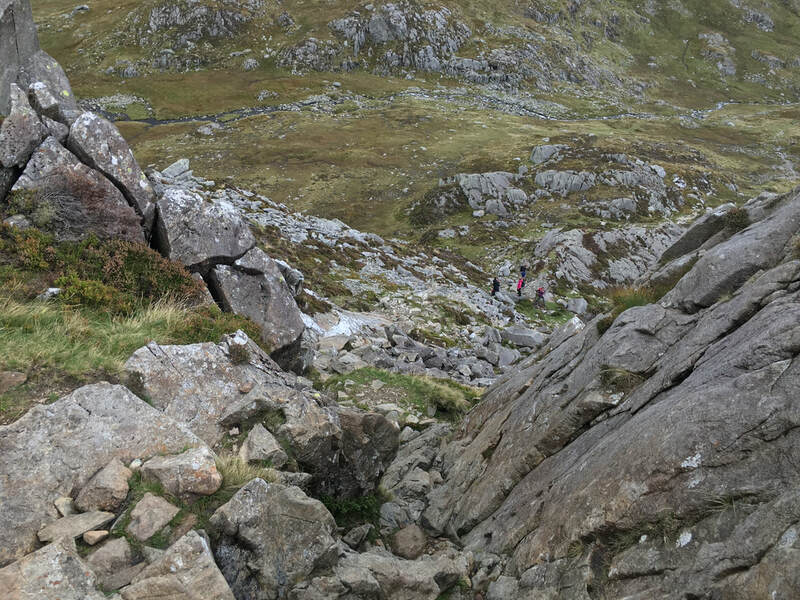 From the top of the scramble a path makes its way above Ffynnon Lloer to finally reach the summit of Pen yr Ole Wen. 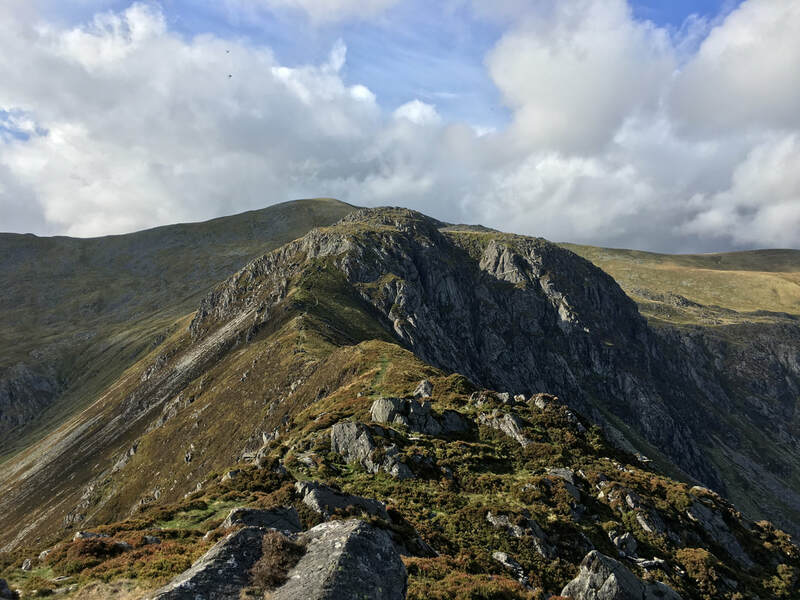 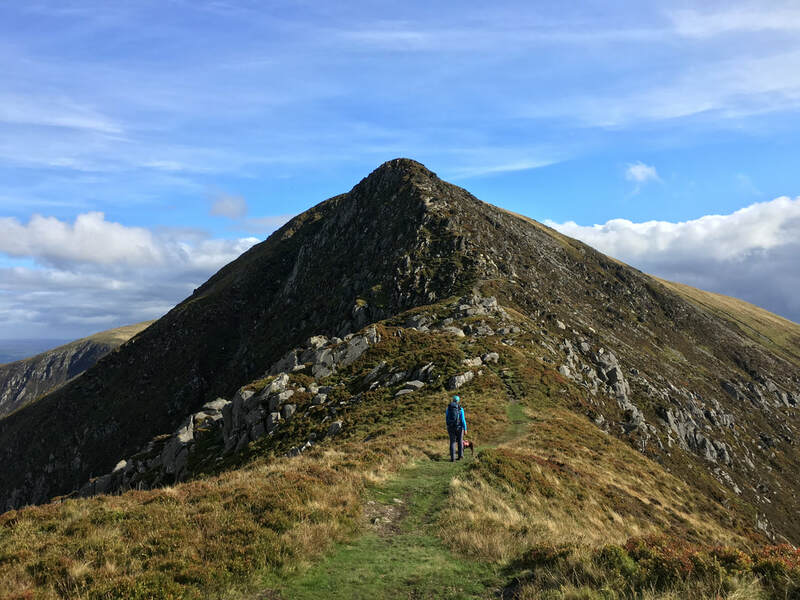 ​The summit affords fantastic views in all directions and it is worth venturing a 100 yards or so to the west in order to see the fantastic view over to Foel-goch, Elidir Fawr & Mynydd Perfedd. 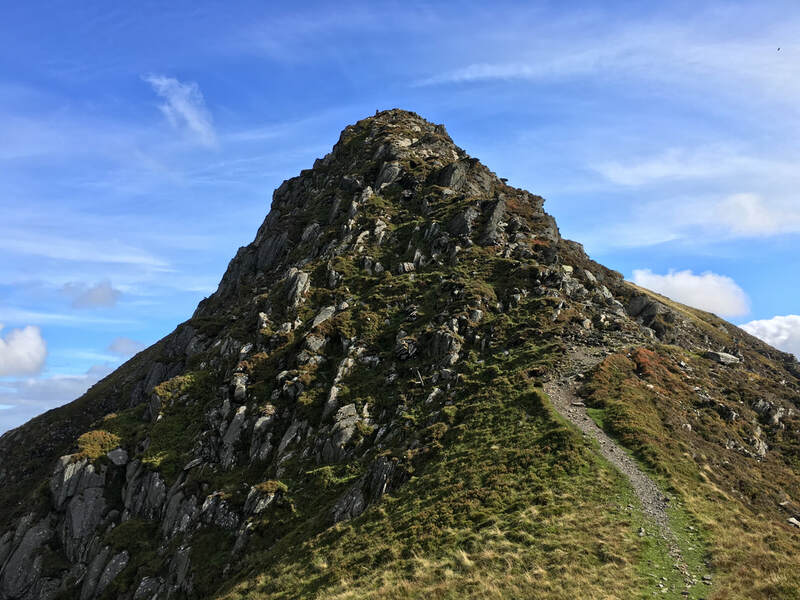 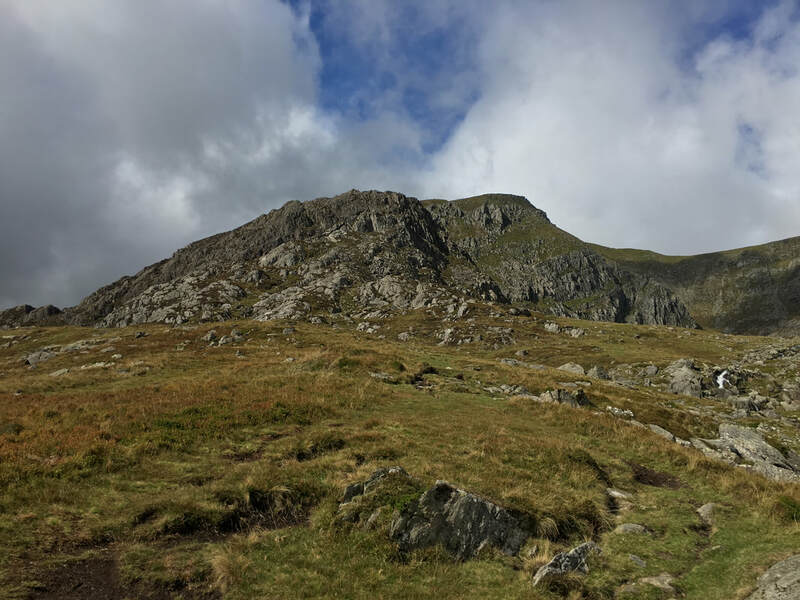 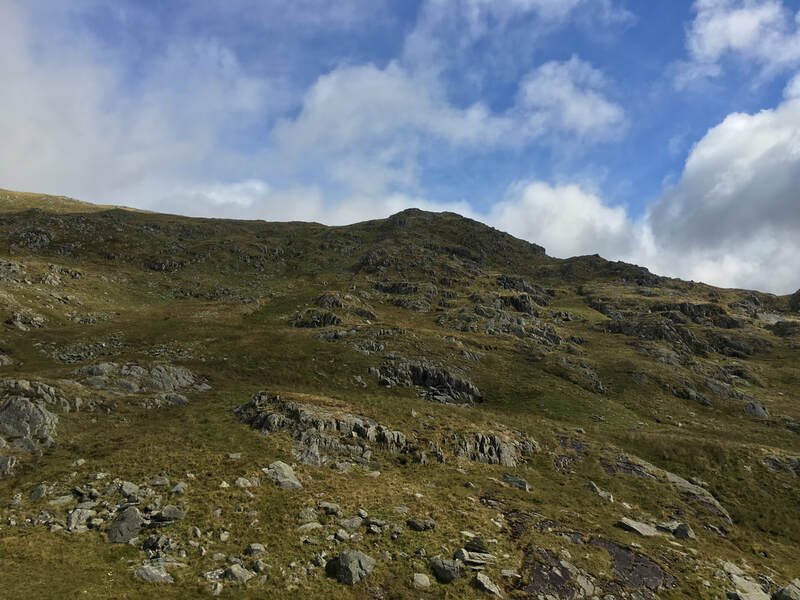 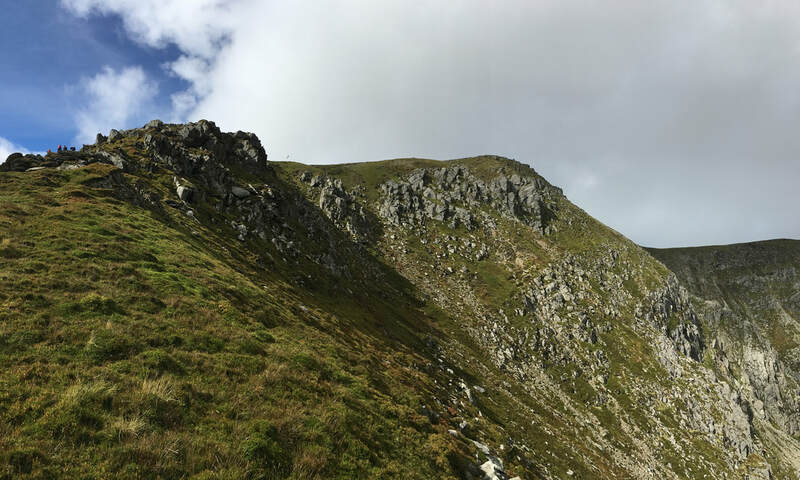 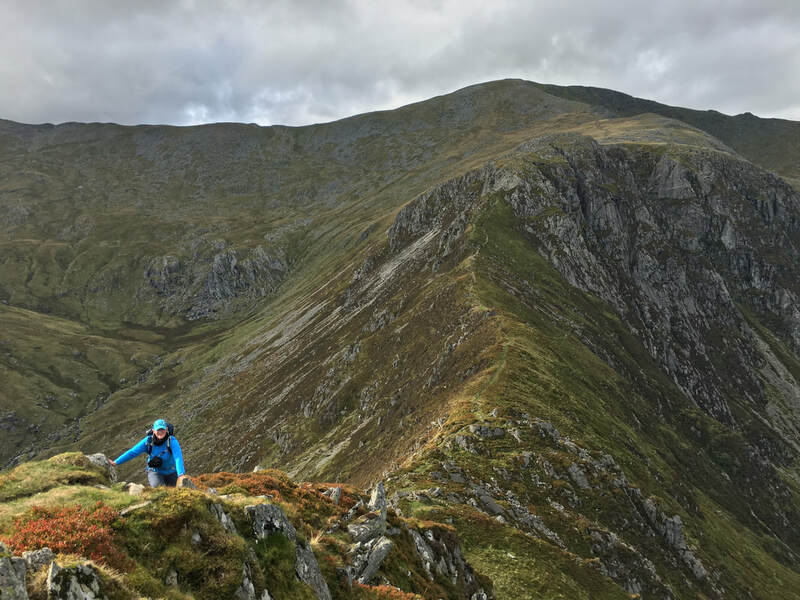 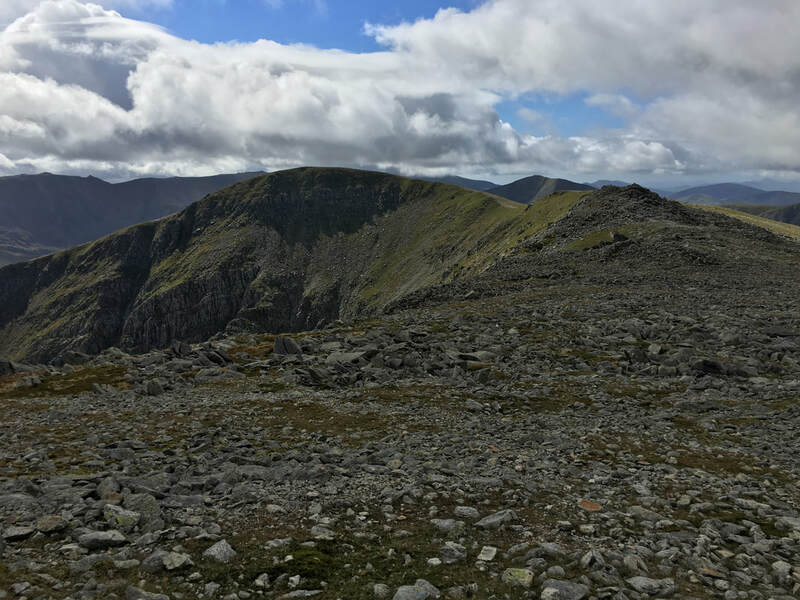 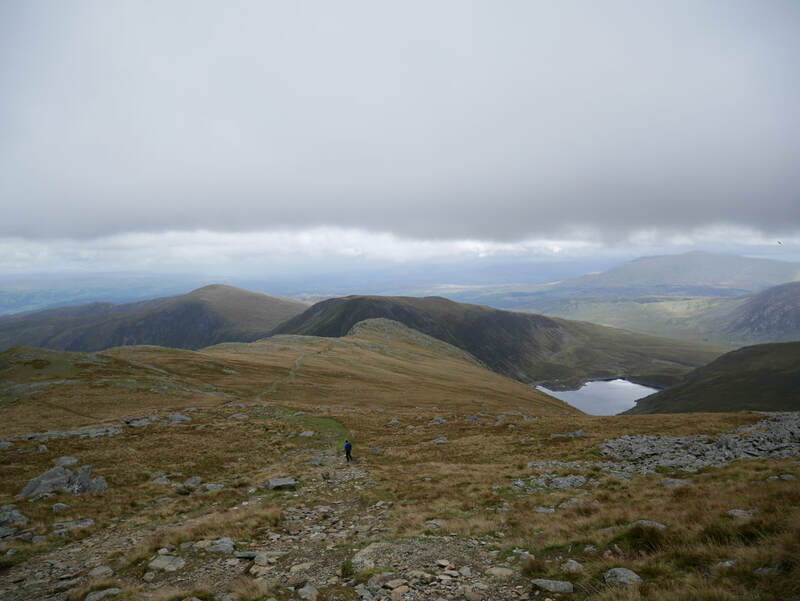 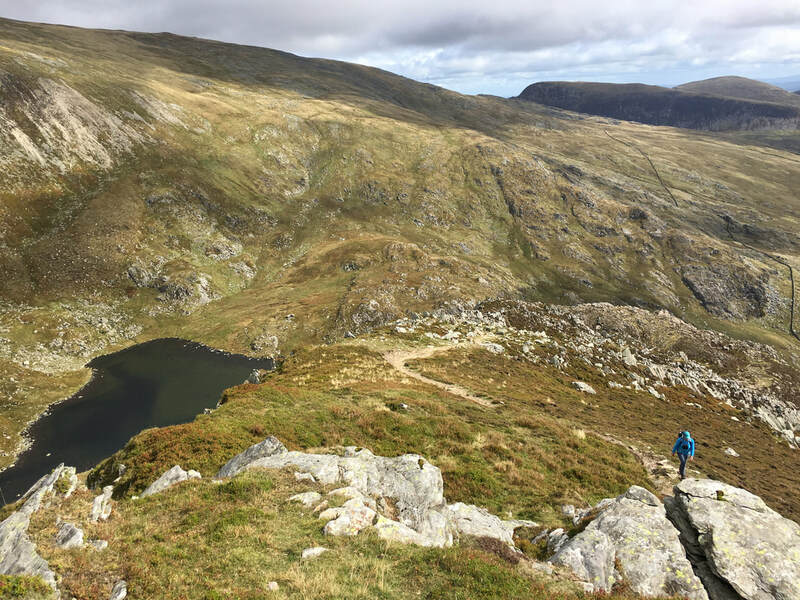 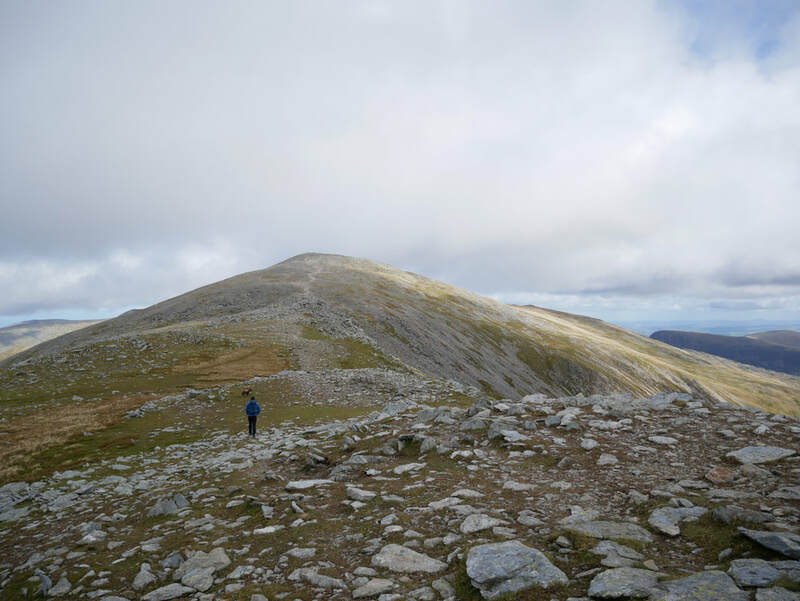 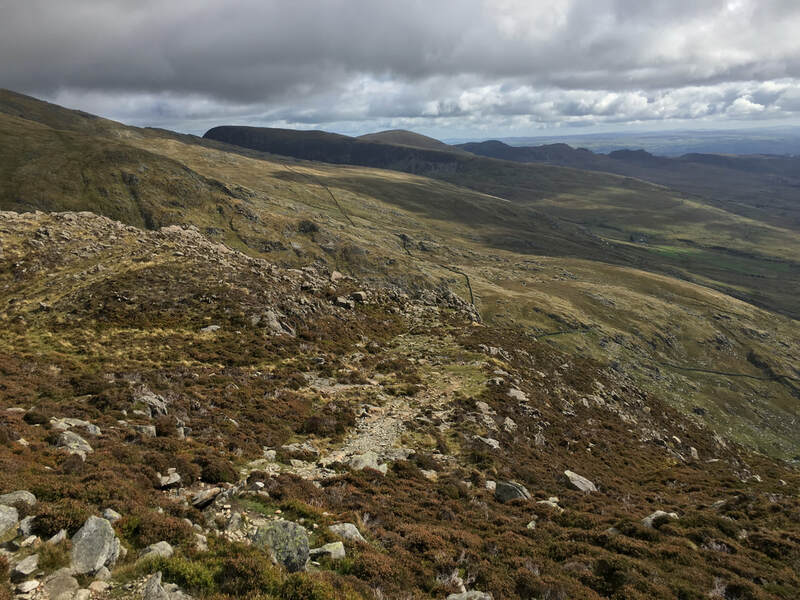 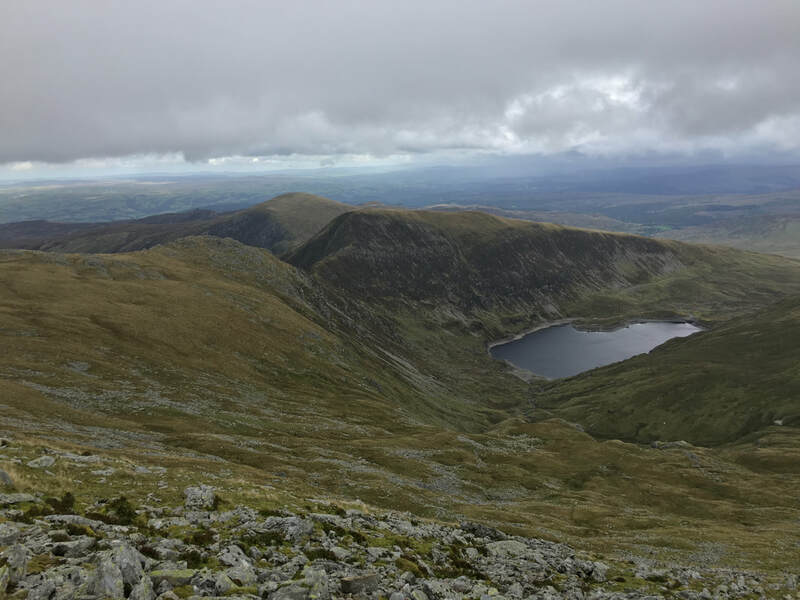 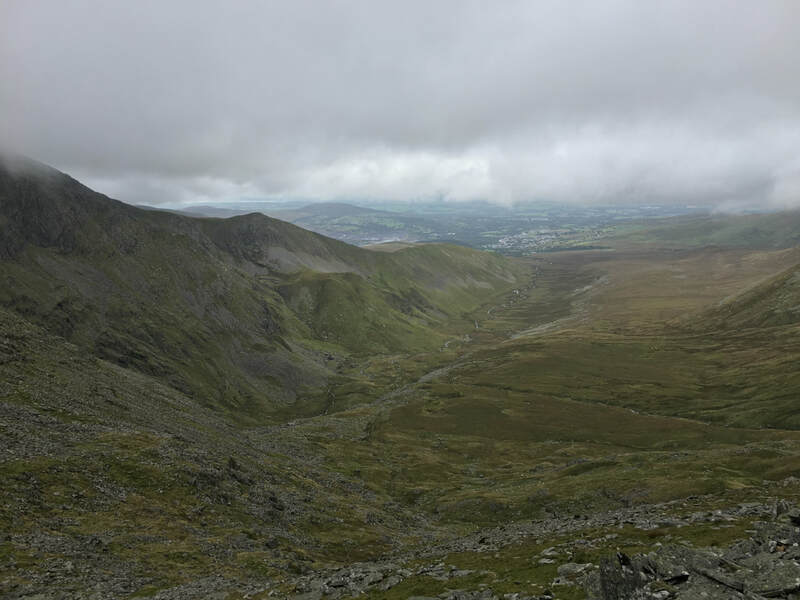 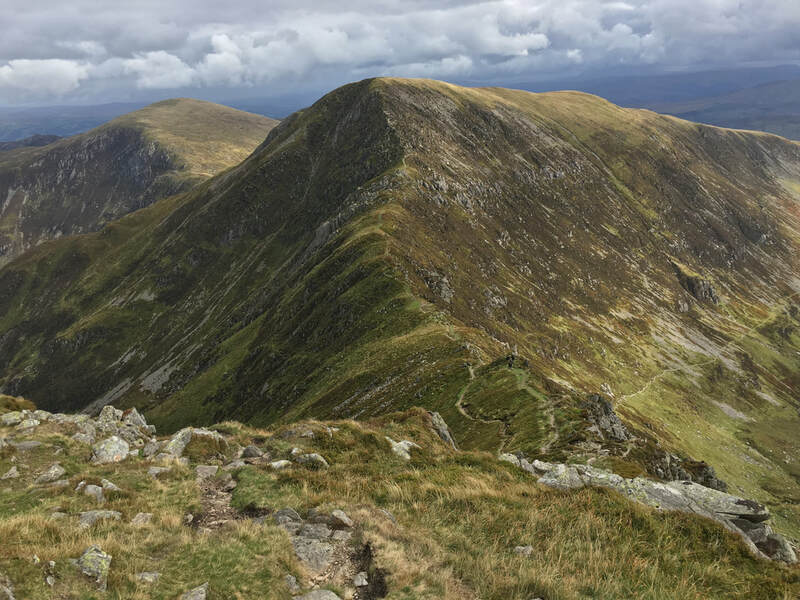 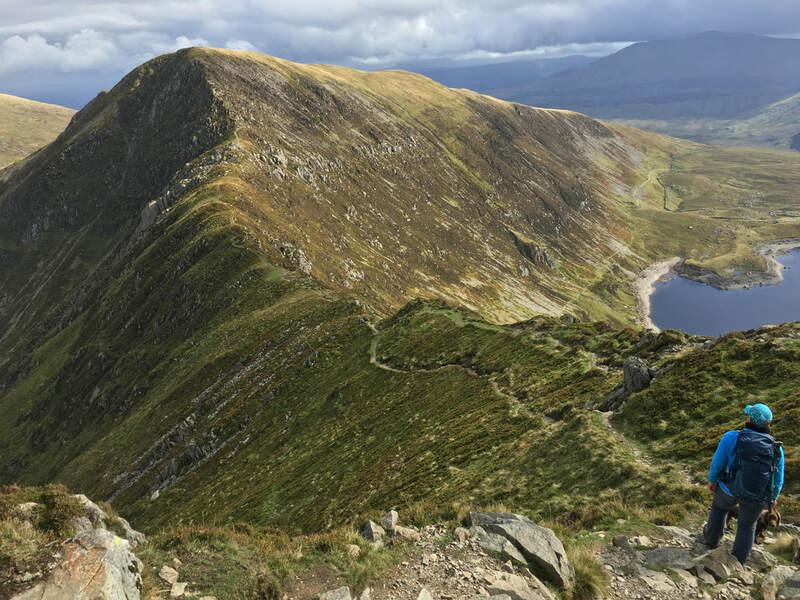 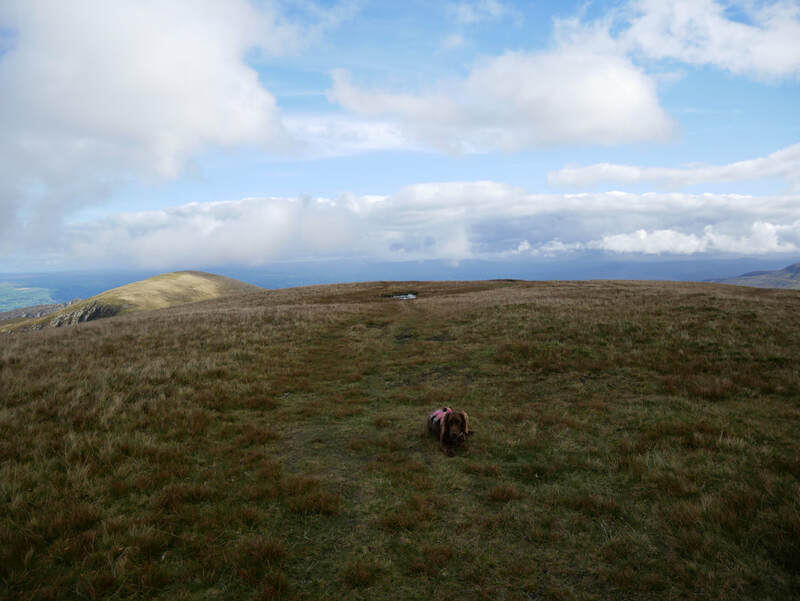 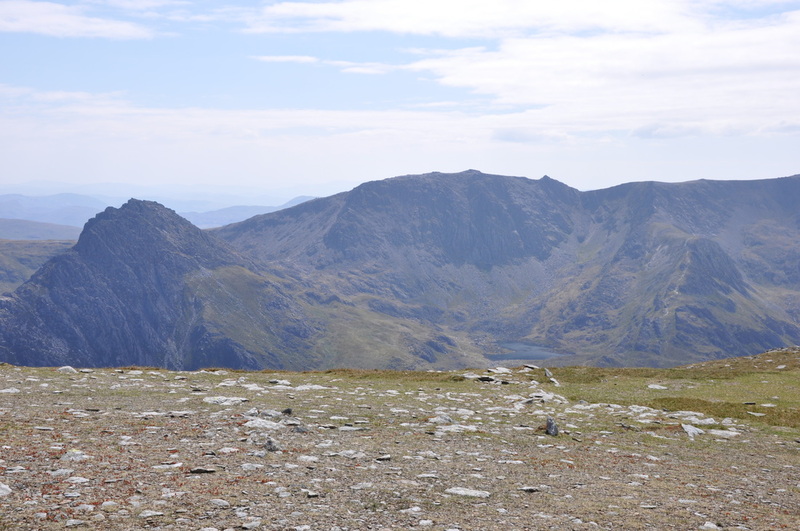 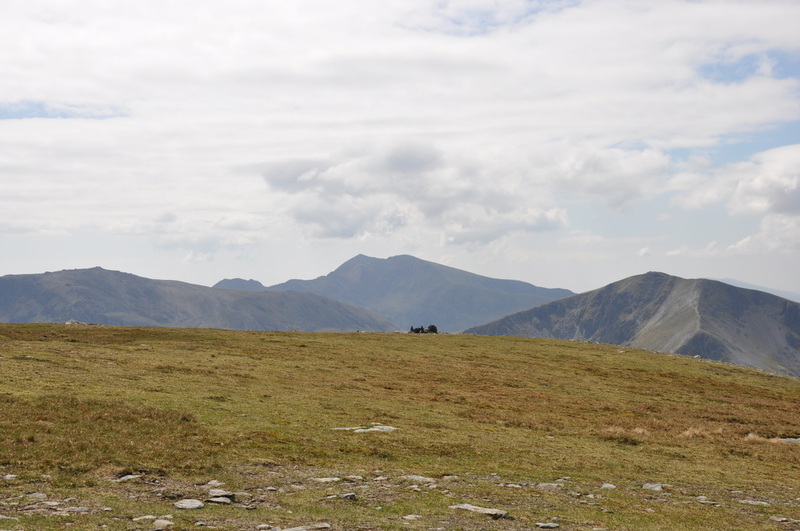 Leaving the summit there is now a delightful ridge walk to firstly Carnedd Fach then the rise to Carnedd Dafydd although there is an option to drop down and bag the Nuttall of Foel Meirch. 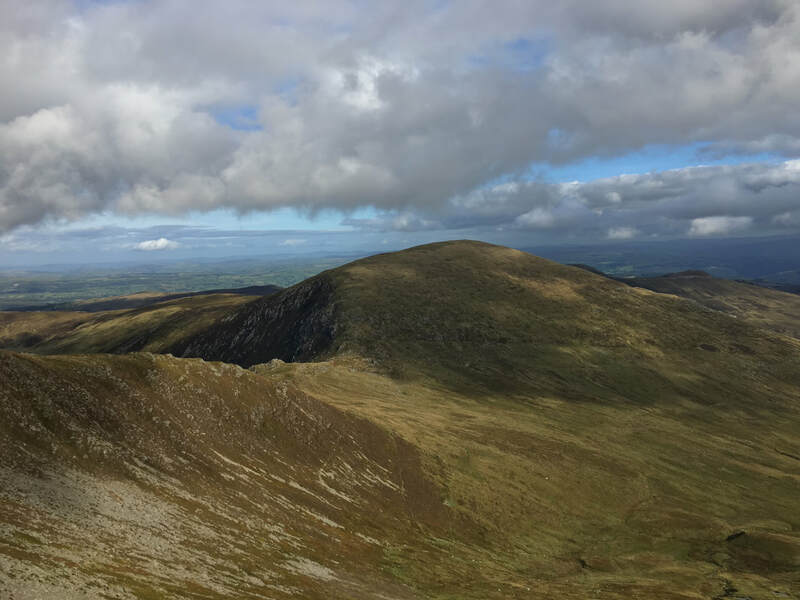 Carnedd Dafydd's summit has an array of wind shelters therefore we got out of the wind and had a spot of lunch before making our way via the wonderful ridge walk along Cefn Ysgolion Duon (The Black Ladders) and Bwlch Cyfryw-drum to the summit of Carnedd Llewellyn. 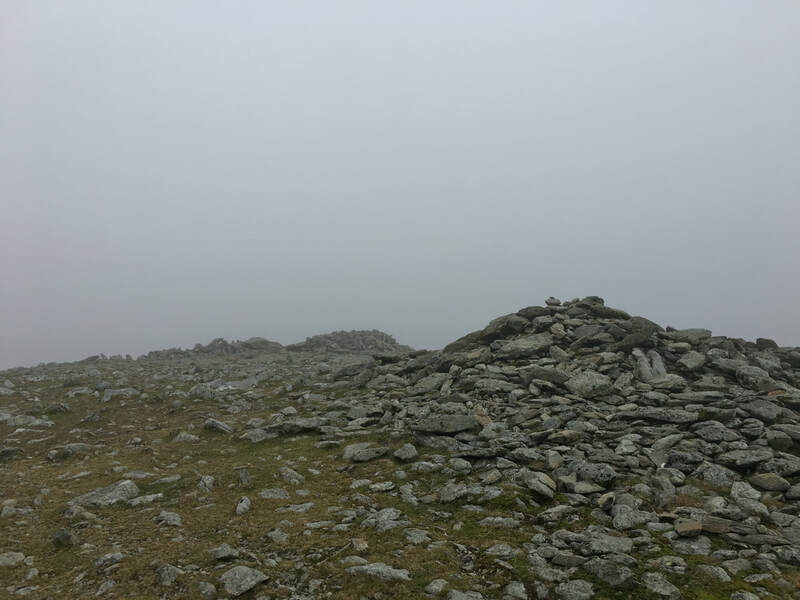 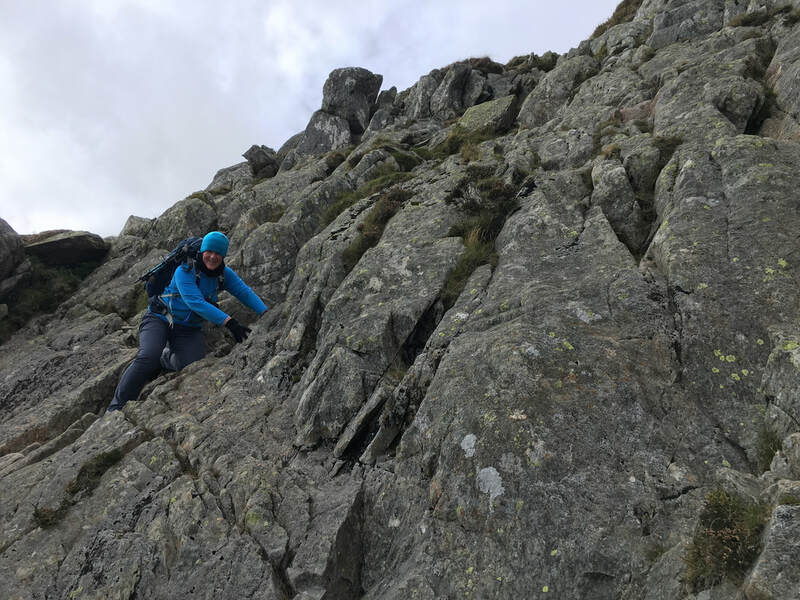 There is a steep pull up to the summit and as we were making our way up it was clear that we would have no views from the top today - a huge great blanket of clag was sitting over the top and did not budge until we were making our descent. 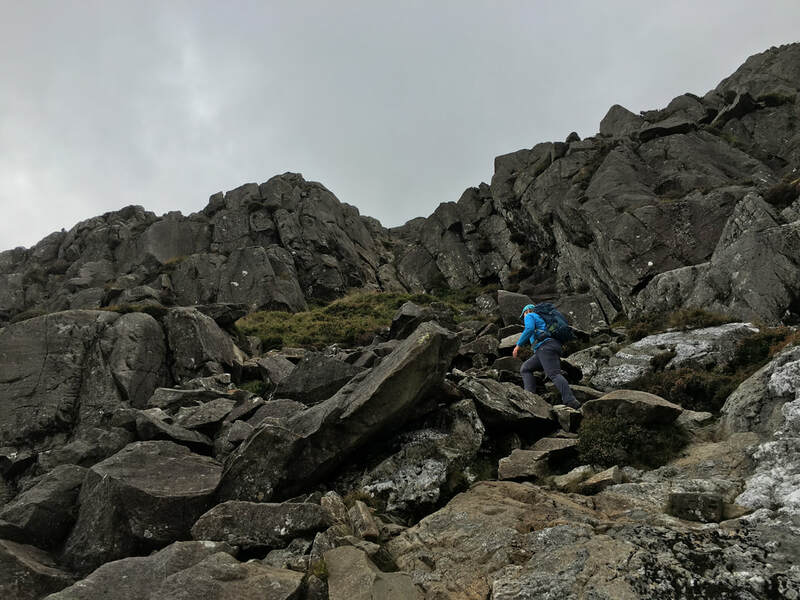 ​The descent from Carnedd Llewellyn in a thick grey soup requires careful navigation and having taken the necessary bearing we emerged from the cloud to see the ridge of Penywaun-wen stretching out ahead of us to Craig yr Ysfa. 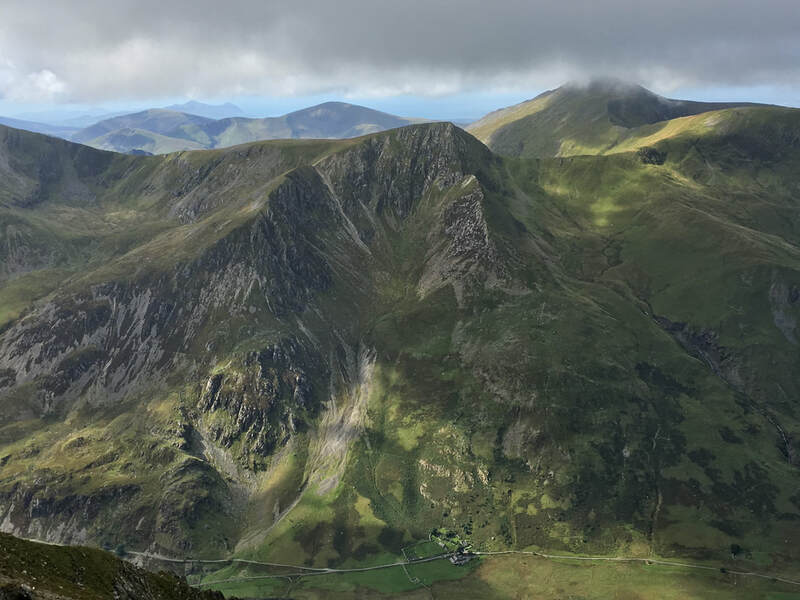 The descent into Bwlch Eryl Farthog is a wonderful steep scramble that requires a little care to be taken - all the while the views down into the Bwlch and over to Pen yr Helgi du are superb. 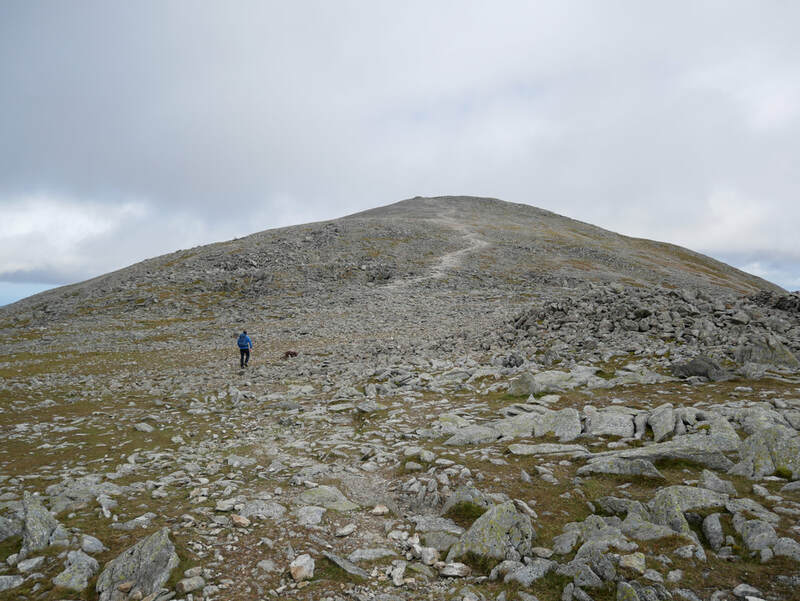 Once down in the Bwlch there is an option to descend back down to the A5 via the eastern edge of the Ffynnon Llugwy Reservoir - we opted to carry on along the ridge and enjoy the exceptional scramble up on to the summit of Pen yr Helgi du to return back to the A5 via the sweeping, grassy ridge of Y Braich - from the road we passed through a gate to follow a good path back to Gwern Gof Isaf. 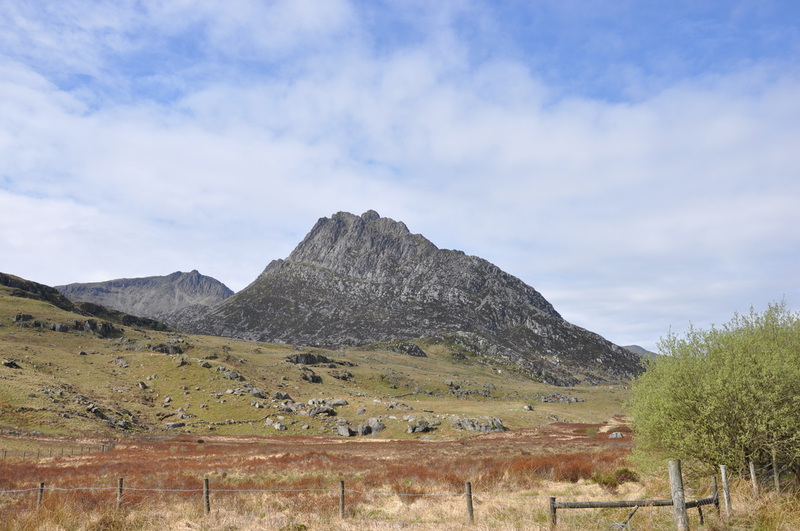 The classic view of the north ridge of Tryfan and the superb east face of this iconic and beautiful mountain. 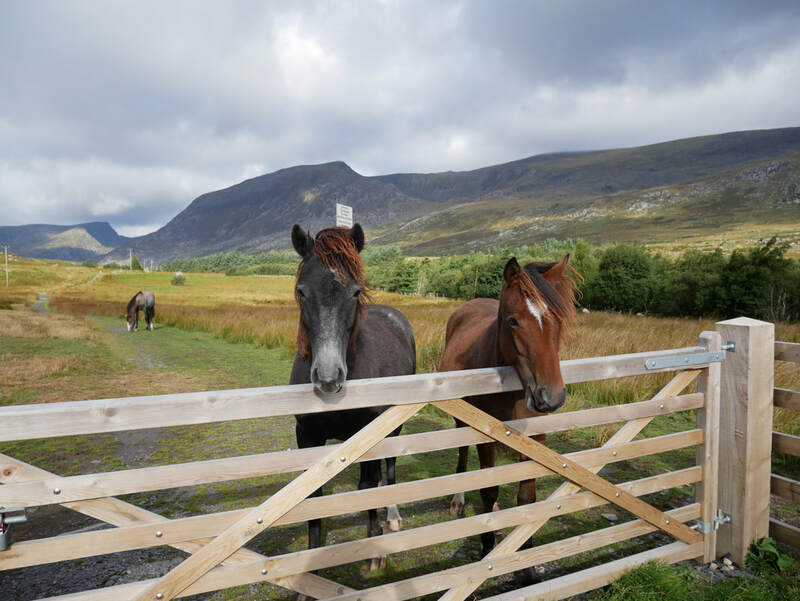 Why the long faces eh fellas? 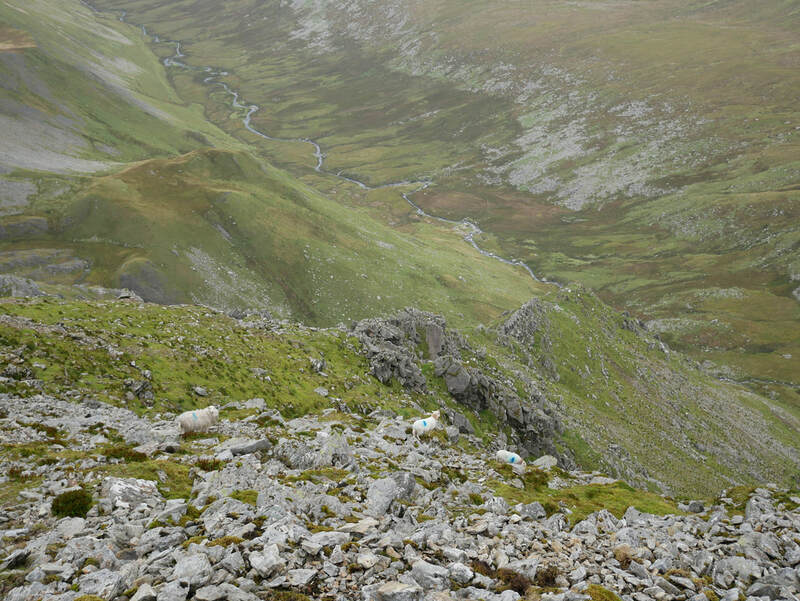 A bit closer - how could anyone tire of looking at that?? 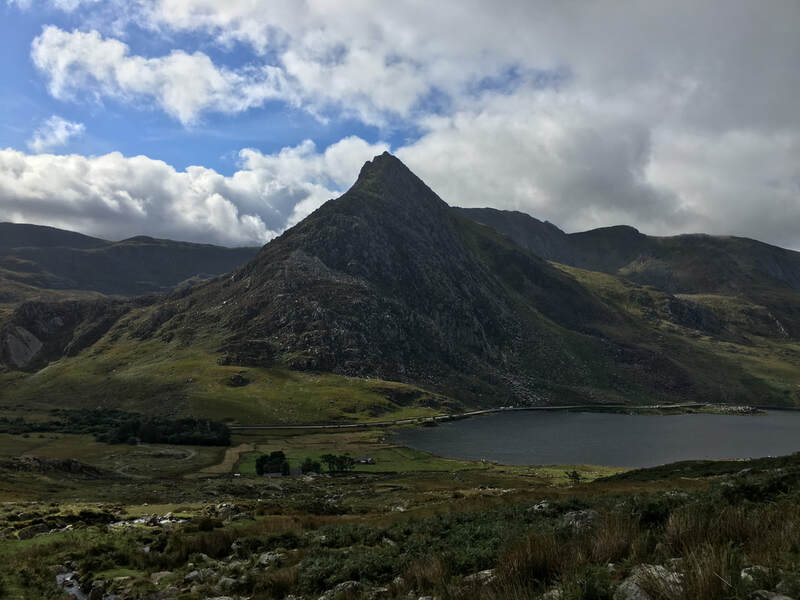 A little higher up and the full majesty of Tryfan reveals itself. 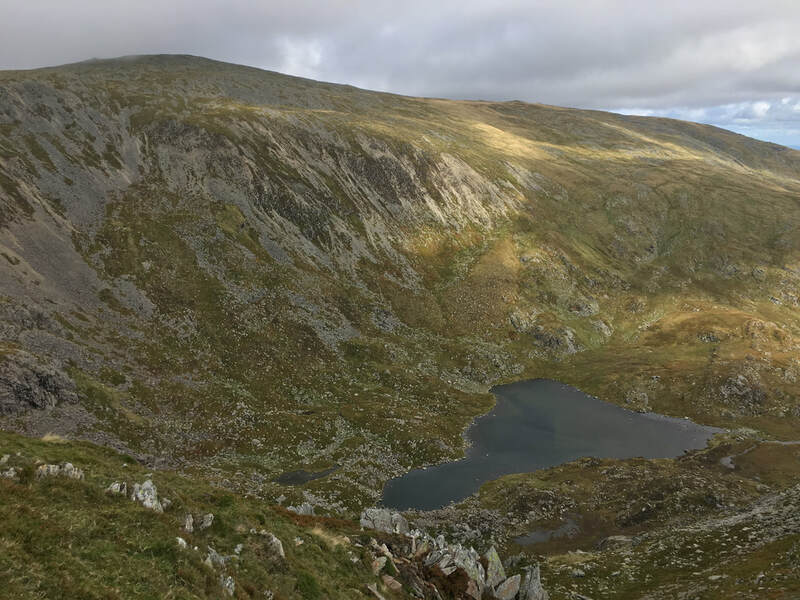 Llyn Ogwen sits serenely below. 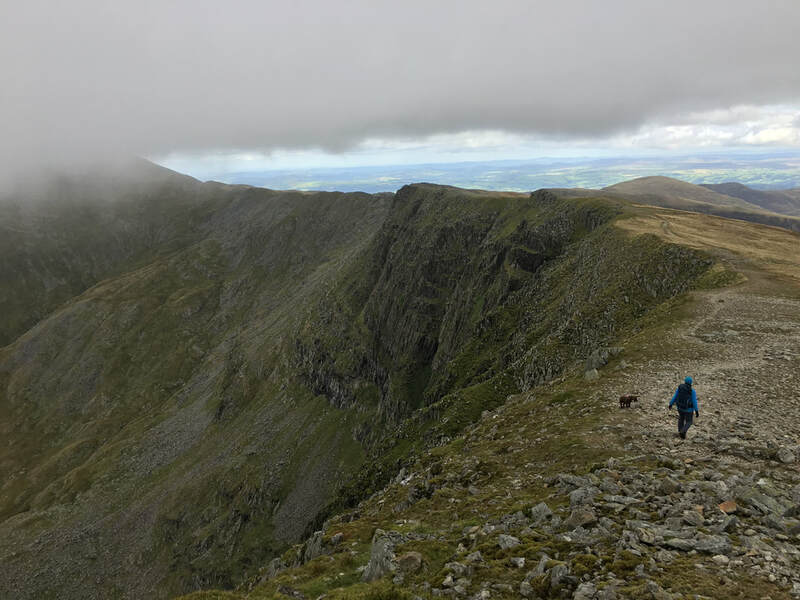 Carnedd Llewellyn ahead - the weather was starting to close in now - would we get any views from the top? 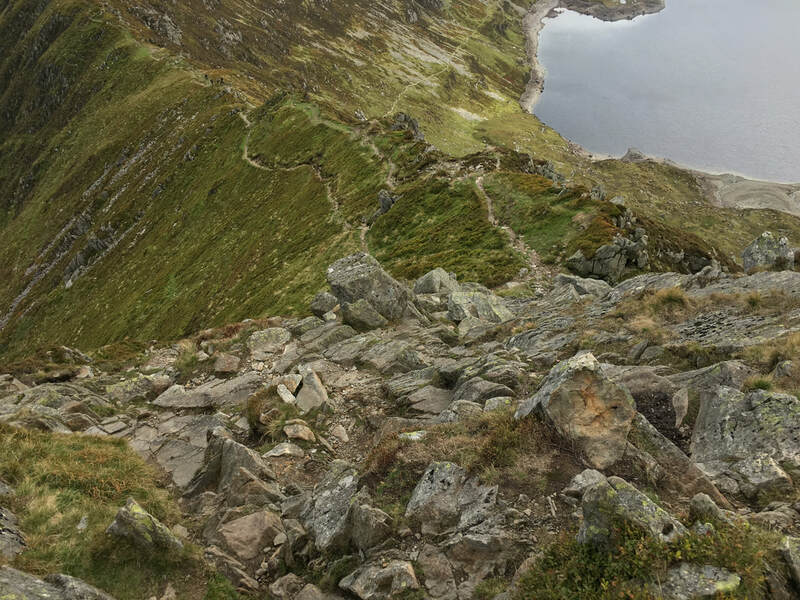 Ffynnon Llugwy Reservoir - if not climbing Pen yr Helgi Du the return to the start is via the path seen to the left. 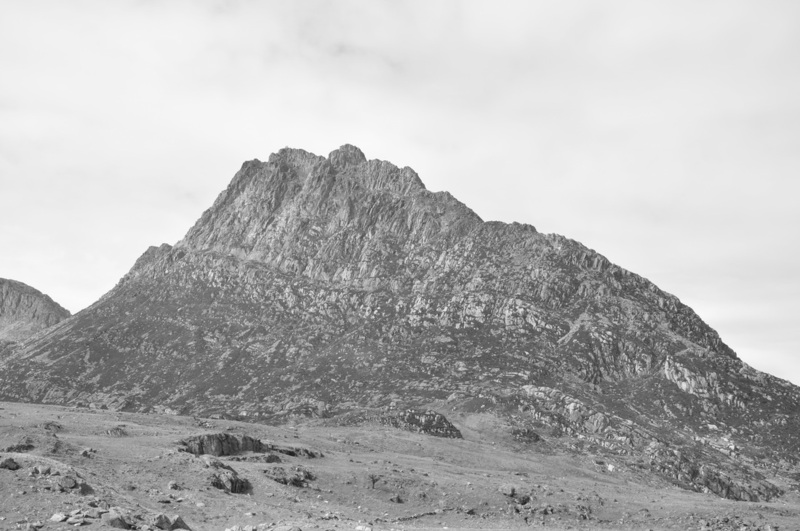 A last look at beautiful Tryfan - this time in mono.